While there are many places where you can bet online, not every site is right for you or able to provide you with what you are looking for. If you are looking for an online sports betting portal that provides a focus on the main US sports, you’ll find that BetOnline has everything you could need.Basketball lovers will be delighted to know that the BetOnline site provides extensive coverage of the NBA and the NCAAB. There is also a focus on the leading domestic leagues in Europe, where future bets can be placed. BetOnline also provides in-game betting and mobile betting options, so if you are looking to stay in touch at all times, this is a site that will work for you.With an approach that is tailored towards US punters and a great selection of promotions and bonuses on offer, you should find that the BetOnline site is an excellent addition to your basketball betting portfolio. If you are looking to bet online, you’ll find that there is no shortage of options to choose from. However, if you are looking to keep things simple when you bet online, a company called BetOnline is going to be of interest. Sometimes there is a lot to be said for keeping things simple and you’ll find that this is an online sportsbook that keeps things nice and simple for its users. The site has had an online presence since 1991, which makes it one of the longest running sportsbooks. With a strong focus on American sports and players, you’ll find the major sports on offer. With a Stats Center available, you can keep up to date with the information and statistics you need to make an informed bet, so for a sportsbook that allows you to bet with confidence, BetOnline is worth checking out. Sportsbooks that focus on the US market tend to hone in on the most popular sites. This is what to expect from BetOnline, who offer punters the chance to bet on 5 main sports and then 11 additional sports. There is also a range of novelty and prop bets to choose from and you can indulge in the Futures market too. The key sports on offer from BetOnline are basketball, soccer, football, hockey and tennis. You’ll find that these are the sports that most people want to bet on, which means that BetOnline probably has you covered. Horse racing is covered in its own section and there are also casino and poker options for players who want more variety when it comes to betting online. For basketball fans, there is a strong focus on the NBA and the NCAAB, so you’ll be able to follow your favourite teams and players throughout the campaign. There are Future market options for both of these disciplines and you’ll also find that there are Future options for domestic basketball leagues in Europe. 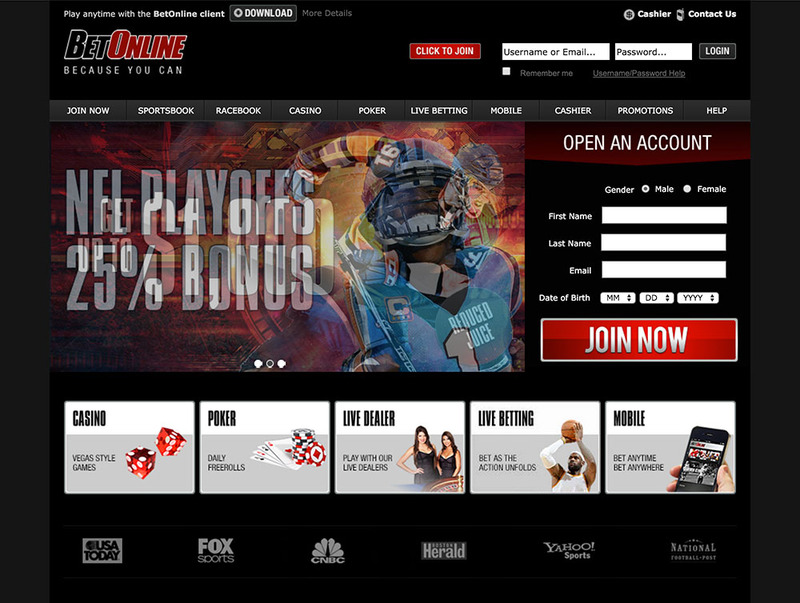 If you are making your first deposit on the BetOnline site, you are entitled to a 25% welcome bonus. You should use the code “FIRST” at the cashier when making your first deposit and this will enable you to earn a 25% bonus up to the value of $1,000. After this players, can earn a 25% bonus on all deposits made on site. You should look to use the promotional code of “LIFEBONUS” and on doing so, you can earn a bonus up to $1,000. Anyone looking to try out the In-Game betting options with BetOnline will find the risk-free first bet a good opportunity. If you win your first bet made in-game, congratulations, but if you lose, you’ll receive a free $25 bet, which means that there is no risk involved with trying out this option. This is similar to the offer provided to players when they try the mobile betting option. If the first bet you make from the mobile betting option wins, great news btu if you lose, you will receive a free bet up to the value of $50. There is also a refer a friend bonus available with the BetOnline site and for every friend you bring to the site, you’ll receive a $50 free play. There is no limit on the number of refer a friend bonuses you can receive so if you are a sociable person, get your friends on to the site and rack up the bonuses! 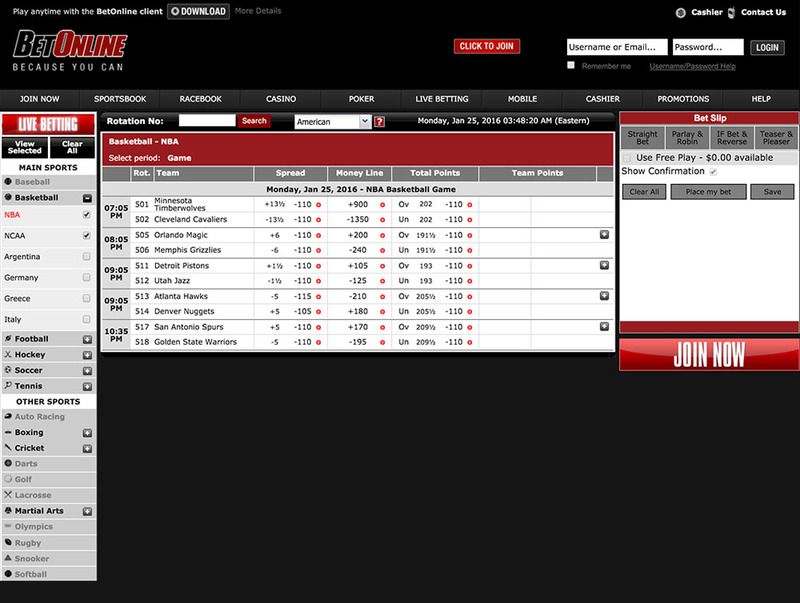 On the home page of the BetOnline site there is a prominent box on the right hand site which allows you to enter your basic details to open an account. There is also a CLICK TO JOIN box at the top of every page on site so no matter where you land on the BetOnline site, you should find that the process of signing up for betting action and fun is harmless. Once you have signed up for a BetOnline account, you’ll want to get involved with the betting action, and this means depositing funds. Sites that focus on US players don’t offer as many deposit options as their European counterparts but you should find that there are enough options to place money into your account. BetOnline has considerable experience in the online sports betting market and they provide a strong range of betting options on the main sports. It is far from the flashiest or most exciting sportsbook but if you are looking for a straightforward and effective sports betting site, BetOnline will give you what you are looking for.